Drawn from the collection of Dr. Carlos Rincn-Mautner, Hands on Clay, Hands on Stone presents objects that reveal the inspiration and craftsmanship of peoples that inhabited the lands now known as Colombia, Ecuador, and Mexico. The people of this region transformed the earth leaving clay and stone materials that today represent their ways of life and interpretations of the environments in which they lived. Objects include bowls, tools, buttons, body or textile stamps, figures and masks. Rincn-Mautner currently teaches at the University of Nevada-Las Vegas. From 2001-2004, he was a UW Professor, teaching courses related to environment and society, archaeology, art history, and Chicano Studies. This exhibition presents objects that reveal the inspiration and craftsmanship of peoples that inhabited lands now in Colombia, Ecuador, and Mexico. They transformed the earth leaving clay and stone materials that represent their ways of life and interpretations of the environments in which they lived. Cultural developments along the rivers, mangrove swamps, and estuaries of the Pacific coast of northern South America are quite ancient. 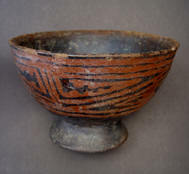 Realistic ceramic representations and sophisticated metal working traditions are among the major achievements of the peoples who inhabited the Pacific coast of Ecuador and Colombia over two thousand years ago. Their cultures have been named after the major sites of La Tolita and Tumaco, located on either side of the border between Colombia and Ecuador. Settlement of the coastal rainforests in both countries antedates the settlement of the Andean sierras, to the east, by many thousands of years. It was only after the seventh century of the Christian era, when volcanism in the Sierra ceased, that permanent settlements became established there. Distinct cultures known for their abstract representations of animals and humans developed in the fertile Andean valleys. The objects in this collection, on loan from the Rincn Mautner family, are arranged to highlight the range of materials necessary for subsistence and the relationship each of these societies had with their environment. Funded in part by the National Advisory Board of the University of Wyoming Art Museum.